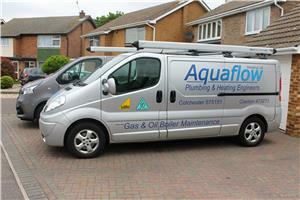 Aquaflow Heating Ltd - Bathrooms, Central Heating Engineer based in Kirby Cross, Essex. We are a small family run business that has been working in and around the Colchester and Clacton areas for over 30 years. Aquaflow Heating Limited is registered with Gas Safe and can carry out any gas boiler installation, service or repair. We are also registered with Oftec so we can install, service or repair Oil fired appliances and oil tanks. We cover all aspects of plumbing, heating, power flushing, controls and maintenance. Kitchens and Bathrooms can be designed and installed complete with any building work required. Aquaflow will provide a professional, reliable, family run service.